When you open the box, this cereal smells very fruity - almost like an air freshener for a car. The pieces are round like traditional Cheerios and somewhat pink with little specs of red and purple. You get a very big burst of fruit flavor in the first couple of bites. It reminded me a little of mixed fruit jam. 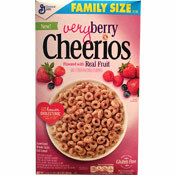 As you eat more, the traditional, terrific flavor of traditional Cheerios starts to overtake the fruit flavor. Personally, I liked that. To be inundated with that heavy fruit flavor throughout the entire bowl would have been too overwhelming. The milk at the end of the bowl was a light purple with dark purple specks. It was mildly fruit flavored. Overall, I enjoyed the cereal. However, Honey Nut Cheerios and traditional Cheerios are both quite a bit better than this new cereal. Nutritional Considerations: Each 3/4 cup serving has 110 calories, 1.5 grams total fat (0 grams saturated and 0 grams trans), 0mg cholesterol, 110mg sodium, 22 grams total carbs, 2 grams dietary fiber, 9 grams sugar and 2 grams protein. 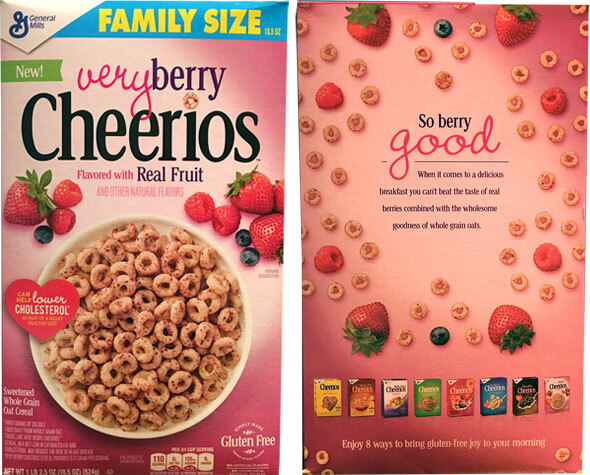 What do you think of Very Berry Cheerios?